Taken from the Stage Archive. 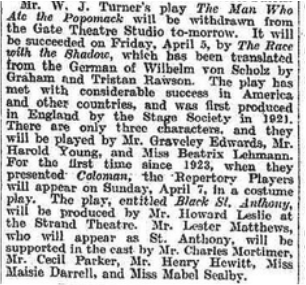 The play was presented by the Repertory Players and produced by Howard Leslie. From The Stage - Thursday 04 April 1929. Charles Mortier is, of course, Charles Mortimer. Robert Douglas was later to become a famous Hollywood star, performing in such films as "The Prisoner of Zenda", which also starred Stewart Granger, who was also to feature on the stage with Charles Mortimer. Cecil Parker became an established actor of film, theatre and television, starring such films as "The Ladykillers" and "The Court Jester", both of 1955. 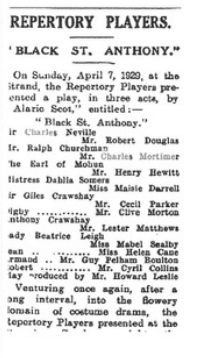 Charles Mortimer played Ralph Churchman in "Black St. Anthony" at the Strand Theatre, London, on 7 April, 1929. The play was set in the 18th century, involving several romances. The Era - 3 April, 1929. 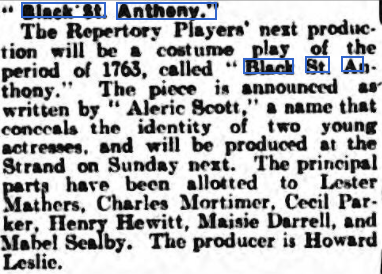 The Repertory Players neat production will be a costume play of the period 1765, called Black St. Anthony. The piece is announced as written by Alecia Scott, a name that conceals the identity of two young actresses, and will be produced at the Strand on Sunday next. The principal parts have been allotted to Lester Mathers. Charles Mortimer, Cecil Parker, Henry Hewitt, Maisie Darrell, and Mabel Sealby. The producer is Howard Leslie. The Era - 10 April, 1929. .... and Mr Robert Douglas and Mr Charles Mortimer contributed clever little studies of the gambling, hard drinking gentlemen of the period.